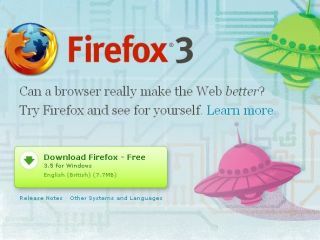 Firefox 3.5 has arrived, with Mozilla confirming that the eagerly awaited update to the browser is finally ready for public consumption and the company predicting massive downloads in the coming hours. The free software is now available and available in over 70 languages (Mongolian was apparently not confirmed the last time we spoke to Mozilla). The most obvious change to the browser is the speed - with Firefox 3.5 10 times faster than Firefox 2 and twice the speed of 3.0. "3.5 is important to keep the momentum going from 3.0," Mozilla's VP of Engineering Mike Shaver, told TechRadar recently. Privacy is also a key addition - with private browsing arriving (a little later than its rivals) and functions like 'forget this site' and 'clear recent history' keeping your private browsing personal, and your personal browsing private. Location-aware browsing does exactly what it says on the tin, allowing users to search locally, and features like 'tear off tabs' and the already loved 'awesome bar' will no doubt prove popular. Mozilla believes that take-up for 3.5 will be swift and widespread, with Shaver stating: "We are currently at 90 per cent of our users on the latest Firefox and we'll probably get 60 to 70 per cent in first three months on Firefox 3.5. "It's kind of hard to predict exactly because each release is different and our user base is almost double what it was when we released Firefox 3." The download is available from Mozilla's site at http://www.mozilla-europe.org/en/firefox/ - although Mozilla is still updating sites so keep checking around until you see 3.5.